Please follow Apple’s instructions on making a backup using iTunes. Unfortunately, you can’t modify encrypted backups. Please make an unencrypted backup to use with iBackupbot. You can re-enable backup encryption after you’re done with the modifications! You may disconnect and continue using your device after making the backup. Please visit http://www.icopybot.com/download.htm and download and install the trial software for your operating system. You may also purchase the software if you plan on doing very many modifications to your backups. The trial version is sufficient for this tutorial. Please note that I have experienced issues when using iBackupbot: it seems to crash sometimes when you disconnect your device without ejecting it first. It’s better to be double-safe than double-sorry, so I recommend you to make a backup of the backup you made in iTunes. In case anything goes wrong, you can always restore from this backup and you’ll be back to normal. Open “iBackupbot” application (from Step 2) and let it scan your iTunes backups. Select the most recent unencrypted backup (the one you made in Step 1) in the “backup list” in the top left. Then click “File” in the menu bar and and choose “Duplicate”. Connect/insert your backup medium to your computer. Select this medium in the destination folder selection that has appeared on screen. Click “Open” and wait for the copying process to finish. After that, eject and disconnect the backup medium. Repeat steps 3 to 5 but select a folder on your local hard drive for the destination. Choose “File”, “Open” or click the open button on the top far left. Navigate to and open the copy of the backup you created in step 3.6. Now, please refer to this Google Docs spreadsheet I maintain for what hidden settings and features you can tweak using iTunes backups. 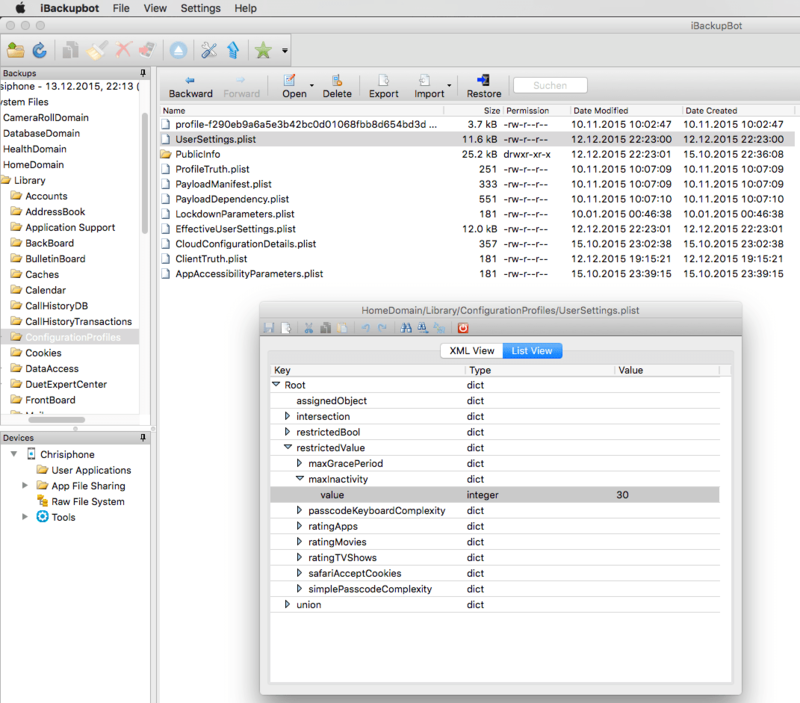 Once you have selected the feature(s) you want to tweak, note their path, filename, key name and possible values. Using the information you just noted, navigate to the path of the setting/feature you want to change. Do this in the folder navigator on the top left side of the screen. Now, look for the key that you noted and edit its value to your liking (within the limits/instructions that are in the spreadsheet). Note that in the trial version of “iBackupbot”, you can’t search for things inside files. As of iBackupBot version 5.3.7, you can now edit .plist files in the list view as well! “List View” makes it easy to find the keys you’re looking for. To edit the file, it’s easiest to switch to the “XML View” and find the key from the spreadsheet. Once you’ve made all changes you wanted to, connect your device to your computer. You will need to unlock your device and disable Find My iPhone to do the restore. If you’ve altered several files, proceed with 5.1. If you’ve only changed one or multiple files in the same folder, skip 5.1 and follow the instructions at 5.2 instead! 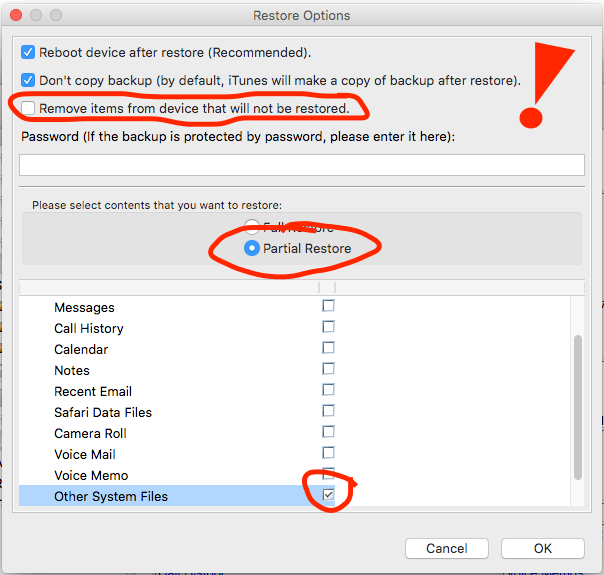 Right click the modified backup in the folder viewer and choose “Restore to device”. …and hit “OK”. iBackupbot will restore the backup to your iDevice. Select all the files you have changed (must be in the same directory). Then, click the “Restore” button in the top menu. A small window will appear. Make sure the top two boxes are ticked and click “ok”. Connect your device to your computer and open iTunes to the iDevice synch page. If you disabled backup encryption in paragraph 3, re-enable it now. Click “Backup now”. iTunes will make a full backup of your device that includes all changes you’ve made in iBackupBot. Done! When you restore from this backup (or a more recent version of it), your modifications will be restored as well! Don’t forget to re-enable Find My iPhone when you’re done! If you discover additional keys and plist values that can be modded, please share them in the comments below. Thanks! Copyright: This post is based solely on my original research. Do not copy parts of the article or the entire article without prior written permission by me. You may quote from two (2) paragraphs of this article for the purpose of sharing it on other blogs or social media without my permission. Do not quote entire paragraphs. When linking to this article, please make sure it's apparent this article was written by me (Chris via CONATH) and not you or anyone else.